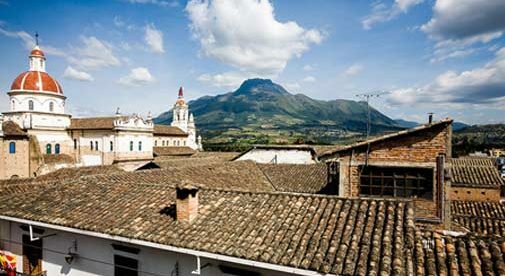 The tranquil colonial setting of Cotacachi makes for the perfect retirement destination. Eight years ago, I met a woman at a craft fair who regaled me with her plans to move her business to Ecuador. Intrigued, I researched Cuenca, Ecuador, planning a two-week trip with my ex-husband to see if retiring to a country outside the U.S. was feasible or only a pipe-dream. Shortly before leaving, we watched an episode of House Hunters International featuring Cotacachi, a small town of approximately 9,000, only a two-hour drive north of the capital city of Quito and our plans changed. Little did we know this slight change would alter the course of our lives. After spending only four days in charming Cotacachi, prior to visiting Cuenca, we were smitten. We bought a lot and signed a contract to build a house. In retrospect, our approach was too hasty, but thankfully, it has worked out well. The climate, low cost of living, slow pace of life, friendly people, and the growing expat community in Cotacachi appealed to us greatly. My 401k built and furnished my home on the outskirts of town in a small gated community. Talented local craftspeople built the furniture, made the custom curtains, and erected a wrought-iron fence at the rear of the property—to prevent cows from wandering through and leaving “plops” in their wake. The idyllic view from the kitchen window reveals trees, farmland, and black and white cows dotting green hillsides. To the left and right rise the Imbabura and Cotacachi volcanoes. In cooler weather, snow caps the peaks, but the temperatures here in the foothills seldom require more than a light jacket. Year-round, spring-like weather produces fresh fruits, vegetables, and cut flowers for a fraction of what I’d pay in the States. I love decorating my kitchen island with a mixed bouquet any time I feel like it without breaking the bank. When I want to get out, I walk to town and meet friends for lunch. Who can resist a plateful of tasty fresh food for less than five dollars? I never would’ve been able to own a house or retire in Sedona, Arizona, on my Social Security, but here, my home is paid for and my retirement checks cover my monthly expenses—approximately $1,100—with room to spare. I’m saving for a trip to the Galápagos Islands. It’s been on my bucket list forever, and as a certified scuba diver, it’s a must-see now that I’m so close. A former activities director at a large resort in Northern Arizona, I brought my innate creative talents with me. I have my own line of one-of-a-kind jewelry which I continue to make in my new homeland, mostly upon request. In addition, I have expanded my writing interests from non-fiction magazine and newspaper articles to self-published fiction novels. To date, I have authored six books and co-written two movie scripts—one has been filmed and will be released later this year. I even have an opportunity to appear in the second film. How cool is that? Acting at age 63. With five years of Cotacachi living behind me, I still love being retired and my life in Cotacachi. I’m learning to speak Spanish, I have new friends, a writing career that demands as much or as little time as I want to devote to it, freedom to do and be what I feel, and no winter coats or days in excess of 100 F… Life is good.